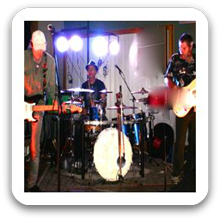 Sydney Band 614 has been playing for about 8 years to hundreds of people all over NSW. We have played small gigs, at Hotels and larger ones, all the way up to Auditoriums that accommodated 700 people. Sydney Band 614 play a wide selection of songs, covering bands from The Beach Boys right up to Black Sabbath. With a professional approach and a love of playing. Always leaving the crowds wanting more. They have prizes and give aways. Lot’s of fun, lots of music.